I have recaptured the craft of making Ireland's oldest product the Bodhrán (Bow-Rawn) (a one sided drum) which is made from Goatskin and treated by a traditional process. This ancient frame drum is traditionally made with a wooden body and a goat skin head. Genuine Goatskin is a natural 'live' material, expands and contracts slightly with changing temperatures, it has an infinite variety of subtle 'veining' and it's rich lustre becomes more beautiful with age. Goatskin has unique stretch properties. The Irish word 'Bodhar' means deaf or haunting. It stirs the spirit when played with either a "tipper" or beater or sometimes it is played with the bare hand, hitting the skin in a racing tone. There are dozens of varieties of beater, differing in length, weight, shape, and balance. Experiment with them until you find one that's comfortable. The bodhrán is held with one hand and played with the other. 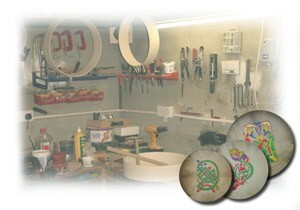 Many of today's Bodhran's are made with no crosspiece or with a crosspiece that is removable. In the hands of a skilled player the Bodhrán can be a subtle and exciting instrument - striking the skin in a variety of ways, pressing and moving to vary the intensity of the sound. The side of the beater is also used to good effect on the wooden rim. Far too many people pick up the bodhrán with the laudable desire to join in the music, but without the dedication necessary to learn to play any instrument properly. If you work at it, you can make lovely music with a bodhrán. If you just pick it up and hack at it, you'll be one more person adding to the bad reputation that plagues Irish traditional percussionists. In Irish traditional music, the tune is everything. You really can't stress enough that getting the rhythm is critical. However, unlike rock and a lot of other styles, the rhythm instruments are not there to create the rhythm, but to draw it out, to accent and highlight it. The rhythm itself comes from the tune - how it is structured and phrased - and how it is played by the melody players alters rhythms greatly. The bodhrán player should match the beat, and follow the music. You've got your drum and beater, but you're not ready to play yet. Playing the bodhrán requires rapid, repetitive motion of your wrist. Warm up before playing, stretch your hands, arms, and shoulders before playing for more than a few minutes. Once you're loosened up, start slowly, give yourself a little time to build up to full speed. Don't over-stress your wrist. Try to play with your wrist as straight as possible; it will reduce the strain. Some people like the sound of a very loose skin; if you play that way, be aware that you're working your wrist and arm much harder. You may want to pace yourself more carefully. If you hurt, stop. Take a break and do some more stretching exercises to work out the cramps. Once you have the basic mechanics, you need to practice. If you want to play with other musicians, then the most important things to practice are matching the beat and controlling your volume. A bad drummer can throw off an entire session; how do you think bodhrán players got their bad reputation? The bodhrán is an accompaniment instrument in Irish traditional music, and the traditional method is to follow the music, i.e. match your rhythm to the those of the music. In order to follow the music, you need to learn the music; so get hold of a bunch of recordings and listen carefully. The better you know the tunes, the better you'll be able to play. Ideally, you should know the tune: you should be able to hum it or sing it or play it on a melody instrument. The Bodhrán plays a leading role in all traditional Irish music. 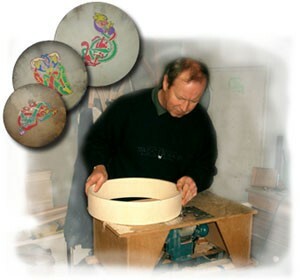 I individually handcraft each Bodhrán in my hometown of Ballycastle in the heart of the Glens of Antrim, after adding the finishing touches they are then sold throughout Europe and the USA. Many different and varying designs and logos are available to give that personal touch. The exact origins of the Bodhran are still unknown. In ancient Ireland, and in fact up until the 1950's, a skin tray or sieve was used to sift various materials. This skin tray was called many names. Interestingly enough, one of those names was Bodhran. There is in Arabic countries a frame drum called a def or daff, which taken phonetically in English and translated to Irish could have become Bodhran. Whichever theory is correct, the Irish frame has developed into an instrument unique to that country, using playing techniques found almost nowhere else in the world.